As I describe in my book Foreign Front: Third World Politics in Sixties West Germany, West Germans read the Little Red Book for reasons ranging from fear, to curiosity, to the hope that Chinese communism might offer a way out for a left trapped between the consensus-minded functionaries of West German organized labor and the calcified bureaucratic socialism of the GDR. 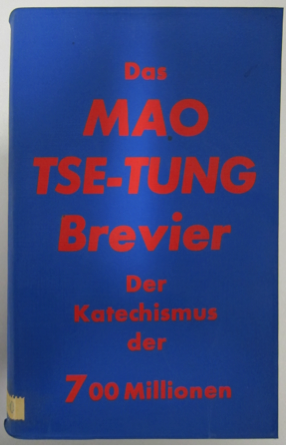 Socialist student activists adopted the Beijing edition as an outward symbol of their distance from both the West German mainstream and the Soviet-led socialist bloc. As in the short film, The Words of the Chairman by student filmmaker Harun Farocki (below), the book served as an accessory to the antiauthoritarian Maoism of an early phase of socialist student activism from 1966 to 1968 and an emblem of later turns to subcultural and sectarian Maoism from 1969 into the 1970s. In all cases, China was distant. The only real contact with Chinese culture came through trips of small numbers of activists to East Berlin to smuggle back films, copies of the Peking Review and, most importantly, stacks of the Little Red Book to sell at political events. 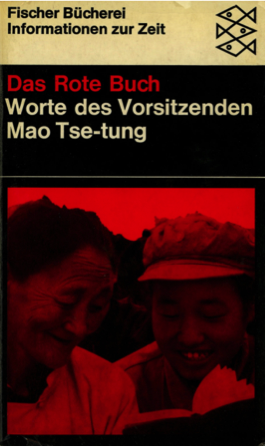 In East Germany itself, there were zero copies of Mao’s book of quotations for sale in 1967. Yet China was nonetheless much closer, and the Little Red Book was a matter of state. Relations with China worsened progressively since the Sino-Soviet Split of 1962-63 reached a low point for the GDR in 1967. 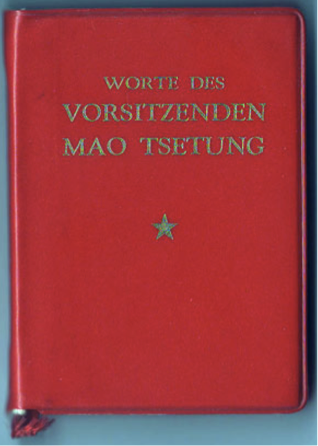 For East German officials, the Little Red Book was a feared sight in the hands of Germans but more so in the hands of the Chinese, including those who perpetrated a series of violent clashes with East Germans in both Berlin and Beijing in the course of the Cultural Revolution. After publishing hundreds of thousands of copies of Mao’s writings in the late 1950s, the chairman’s books had abruptly disappeared from East German libraries and bookstores after the first disagreements between the Chinese and the Soviets in 1960. Young East Germans began to go directly to the source in 1967. Visits to the Chinese Embassy peaked late that year with as many as sixty-three young East Germans a day entering and leaving with Mao buttons and Little Red Books. Students at high schools were reported to be reading the book and wearing homemade Chinese-style caps emblazoned with the words: “Mao fan.” The government finally banned visits to the embassy in early 1968, posting guards at the gate to stop the stream of the curious. Unable to fold the book into a dynamic of apolitical consumption, and thus neutralize it, the East Germans ended up taking Mao’s book of quotations much more seriously than West Germans. If the free market was able to “disarm Mao with fashion” in West Germany as one observer wrote, in the GDR, the only option was the always elusive goal of total proscription. This post is adapted from my contribution to Alexander Cook, ed. Mao’s Little Red Book: A Global History (Cambridge University Press, 2014).